“Assault weapon.” Sixteen-round “clip.” A box of “bullets.” When it comes to firearms, there’s no shortage of misused terminology. Sometimes the error is committed innocently, a simple mistake owing to the shooter’s ignorance. A common example is the interchangeable use of “clip” and “magazine.” However, other misused terms are more harmful. They aren’t just inaccurate; their frequent use can negatively affect the public perception of firearms. Referring to a semi-automatic carbine as an “assault rifle” — a term that implies a fully automatic action designed for purely offensive purposes — is the biggest offender. More on that later. Anti-gun groups, politicians and biased members of the media often use such terms incorrectly — sometimes due to lack of knowledge but often with malicious intent. So, if we as gun owners don’t accurately apply firearms terminology, who will? How can aspiring shooters, genuine journalists or the public at-large hope to receive reliable information? Here are some of the most commonly misused and confused gun terms. A magazine holds shells under spring pressure in preparation for feeding into the firearm’s chamber. Examples include box, tubular, drum and rotary magazines. Some are fixed to the firearm while others are removable. A cartridge “clip” has no spring and does not feed shells directly into the chamber. Rather, clips hold cartridges in the correct sequence for “charging” a specific firearm’s magazine. Stripper clips allow rounds to be “stripped” into the magazine. Other types are fed along with the shells into the magazine — the M1 Garand famously operates in this fashion. Once all rounds have been fired, the clip is ejected or otherwise released from the firearm. 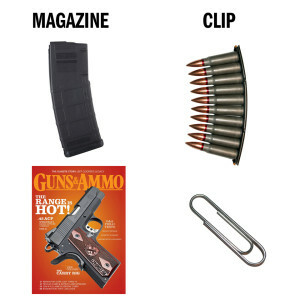 In essence, clips feed magazines. Magazines feed firearms. As noted by David Kopel in an article in the “Journal of Contemporary Law,” the U.S. Department of Defense defines assault rifles as “selective-fire weapons that fire a cartridge intermediate in power between sub-machine gun and rifle cartridges.” The AR-15 and other civilian carbines errantly called assault rifles do no such thing. They are semi-automatic, non-battlefield firearms. However, anti-gun groups have been hugely successful applying the false label to convince Americans that AR-15’s and other semi-auto rifle platforms are a fully automatic, public threat. Much of the mainstream media now uses the “assault rifle” label broadly and without question. To further capitalize, anti-gun groups completely invented the term “assault weapons” to broadly cover everything from home-defense shotguns to standard-capacity handguns — anything they wish to ban. So, while the term “assault rifle” is frequently misused, the term “assault weapon” doesn’t even really exist. That’s the same thing, you say? Perhaps further examples are in order. The best illustration of the differences I’ve come across is courtesy of an unlikely source: the National Oceanic and Atmospheric Administration. 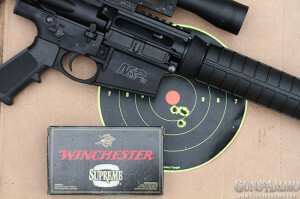 The NOAA’s article “Accuracy vs. Precision” was written with surveyors in mind, but its examples include four, four-shot groups by a rifleman (who we shall assume has a perfectly zeroed firearm and is aiming for the center of the target). In example No. 1, the rifleman’s four shots are scattered all across the target. This is neither precise nor accurate. In example No. 2, the rifleman places a tight four-shot group in the upper left of the target. This is precise (the shots are close together) but not accurate (the shots are far off-center). In example No. 3, the rifleman lands a fairly wide four-shot group near the center of the target. He is accurate (his shots are near the intended target) but not precise (it’s a wide group). In example No. 4, the rifleman delivers a nice, tight, four-shot group directly to the bullseye. This is both accurate (he hit the center of the target) and precise (all four shots were close together). So, while a rifle that consistently produces tight groups is often described as “accurate,” it’s more properly an indication of good precision. There is some gray area with this one. Some use the term “handgun” to describe any hand-held firearm, but only use “pistol” in reference to semi-automatic handguns — not revolvers. I’m of the school that believes pistol and handgun may be used interchangeably. Here’s why. 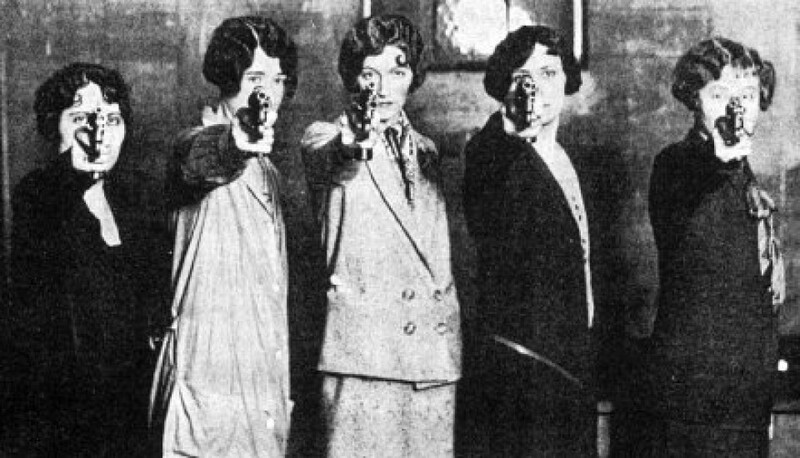 “Pistol” was an established part of the vernacular long before the semi-auto handgun. Therefore it’s safe to say all handguns are pistols, and all pistols are handguns. Every sub-compact pistol is a pocket pistol, but not all pocket pistols are subcompacts. Let me explain. A sub-compact pistol is simply a small, concealed-carry-friendly version of a particular full-size model. For example, the Springfield XD 9mm Subcompact is a 3-inch barrel version of the full-size 9mm XD with 5-inch barrel. There are no standard dimensions per se that constitute a subcompact, and thus sizes vary among manufacturers. “Pocket pistol,” on the other hand, is a generic, somewhat slangy term for any small handgun suitable for concealed carry in a pocket or otherwise. The Ruger LC9, for instance, is a pocket pistol. However, it is not a subcompact. It is a stand-alone pistol, not a smaller version of a full-size gun. Given the vast differences between the terms “bullet,” “cartridge” and “caliber,” it’s amazing anyone with a modicum of experience would confuse them. And yet how many of us have been in a gun store when someone walked in looking for “a box of .30-’06 bullets” when he obviously wanted actual cartridges? A “bullet” is merely the projectile that exits the barrel. Specifically, it’s a non-spherical chunk of lead, copper or other material intended for use in a rifled barrel. The bullet’s “caliber” is a numerical approximation of the bullet’s diameter, often expressed in millimeters or hundredths of an inch. “Bullet” should not be used interchangeably with the term “cartridge” — a bullet is a mere component of it. Cartridges consist of the case, primer, propellant and projectile. In the case of rifles and handguns, the bullet is seated in the cartridge case. Cartridge is also an accurate term for any shotshell. There are two main errors with these terms: using them interchangeably or the false assumption that the extractor also ejects spent shells. Designs vary, so some generalities are in order. In most firearms, the extractor hooks onto the head of a chambered cartridge and pulls it rearward as the action is cycled. The extractor alone does not eject the spent casing — that’s the job of the ejector. In many semi-automatic firearms, the ejector typically looks like a small blade positioned opposite the ejection port. In a nutshell, the extractor pulls the shell rearward until it contacts the ejector, which flings it out the port. There are exceptions. Some double-barrel shotguns, for instance, are “extractors-only.” They are equipped to slightly extract spent shells from the chamber, easing removal by the shooter’s fingers. Other double-barrel shotguns have ejectors that spring spent shells from the gun — no need for extractors. The confusion with the term “shells” perhaps stems from its similarity to the word “shotshells.” I’ve run across folks under the impression that “shells” only refer to shotgun cartridges (shotshells). In reality, “shells” is an accurate — albeit somewhat colloquial — descriptor for any handgun, rifle or shotgun cartridge or cartridge case. Shotshell, on the other hand, refers to a round of shotgun ammunition — most accurately one that contains pellets rather than a slug or other projectile. Here’s a differentiation that tends to get people fired up. Many firearm experts believe that the term “silencer” has no correct usage — rather, it’s an inaccurate slang term for “suppressor.” Suppressors aren’t silencers, they argue, because they don’t actually “silence” the firearm. Guns that fire silently exist only in Hollywood. 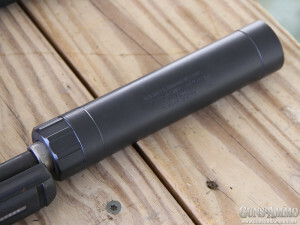 Suppressors merely moderate escaping gases, greatly reducing but not eliminating noise. I believe that’s the most accurate definition. However, here’s where things get muddy: The Bureau of Alcohol, Tobacco and Firearms uses the term “silencer” in its official paperwork.